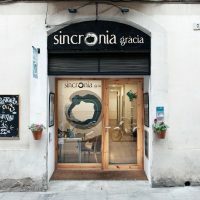 Sincronia Gràcia is a space for yoga, massages and therapies open to the public since 2006 (previously Sattva Yoga). Twelve years of bringing our knowledge and enthusiasm, to help make a difference to people’s wellbeing through the practice of yoga (hatha yoga, vinyasa yoga, integral yoga) and also from holistic therapies (massage, quiromasaje, shiatsu and padovan). In the city of Barcelona, in the heart of the Gràcia neighbourhood, over the last 13 years we have grown wiser, and even more passionate about our vision.